Recording and processing by Norbert Möslang. Mixed by Norbert Möslang at zackstudio . Mastered by Pierre Bendel at zackstudio. Recorded by Eric Mattson at “Manif d’art” at Espace 400e Bell, Québec 12 May 2012. Vinyl cut by Rashad Becker at Dubplates & Mastering, Berlin October 2012. Portrait photo by Georg Gatsas. Back cover photo courtesy NASA/JPL-Caltech. The absolute deep electric-rain-forest sound atmosphere that the listener will hear on this record is the tip of the iceberg of a same rich and elaborate work process. 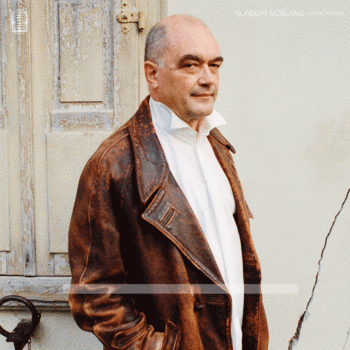 For over 30 years, Norbert Möslang is making the world sound. He does not use things as instruments, but rather captures their vibrations. He immerses himself in the hidden world of vibrations and convert them into loud sounds and thick textures. Living simultaneously in spheres of inside/outside, micro-vibrations, spacial structures, underground music venues, art galleries, underwater, glass windows, body movement, precise equalizers, insects microcosm and electronic devices, Möslang constructs a fascinating and infinite world of both philosophical and physical power. Möslang’s music achoes clearly Brian Eno’s words when he says : « the idea of music as a highly physical, sensual entity – music free of narrative and literary structures, free to be pure sonic experience. And the idea of music as a highly intellectual, spiritual experience». Nonetheless, the “Everyday Cracked-Electronics” are a kind of poetry, a celebration of banality in all of its greatness. Voice Crack can thus be compared to another Swiss duo, the artists Peter Fischl and David Weiss. In their movie “The Way the Things Go”, also made in the mid ‘80s, a chain reaction using every day objects activates a huge fresco of absurdity. The film was shot without a microphone and a Foley artist added the soundtrack in post-production. As such, the sound for this movie was also made with everyday appliances. In the mid ‘80s, without knowing each other, both Voice Crack and Fischli/Weiss turned banality into the marvelous. Instead of having a historically unified style in art and music movements, Switzerland generated very idiosyncratic bands and individualized figures. Think of Celtic Frost, The Young Gods, Samael, Günter Müller, Grauzone, Yello, Lilliput, Christian Marclay or Braintickets, among others. Voice Crack certainly have a place on this dream list! < This country is an exploded megalopolis, its pieces scattered over the whole territory. There are as many underground venues and music festivals in urban areas as there are ancient castles, basements and old vineyard cellars on the fringes of cities and in the countryside. In this context, I attempted to a Voice Crack gig when I was 21 in a city of 35000; in the Middle Ages bulwark of the city of Fribourg existed the annual experimental arts festival. The concert was a path-clearing musical experience. Möslang and Voice Crack opened to me both the ways to experimental noise music as well as sound art performance. These doors never closed and allowed to drift again and again into a continually larger and deeper endlessness; worlds of sounds and noises. But the Swissness stops here. Voice Crack and Möslang belong to a international underground current. When looking through the rear-view mirror it’s clear that in late 70s and early 80s there weren’t many artists working with harsh noise, a list which now read as “classics” : The New Blockaders, Whitehouse and Throbbing Gristle in UK; Hijokaidan, Merzbow, Incapacitants in Japan; NON, The Haters in the states, among only few others. Since the break up of Voice Crack in 2002, Norbert Möslang enlarged his practice to cover all noise and experimental practices, from lo-fi “Everyday-Cracked-Electronics”, saturation/overdrive work, performance and improvisation, field recordings and multi layered ambient-noise composition. Through interconnecting heterogeneous everyday objects; linking the outside sound environment into a quiet art museum by fixing microphones to its windows; filming the underwater Venice’s canal in order to set off never ending imagery flux; allowing a movie to play its own sound track by triggering photo-sensors; Möslang proves to our entire nervous system that the world we inhabit is no more than infinite continuum. To talk about “indoor_outdoor” specifically, again Möslang music drives us from nothing to everything. A field recording in the water of a swiss harbour close from his house is then processed and composed these files in a studio. The second track “hot_cold_shield” is a collaborative duo with Toshimaru Nakamura, the influential member of the Onkyokei scene in Japan, a brutal live improvisation recorded at “Manif d’art” in Québec this year.